We unite to bear witness to and accept God's love through Jesus Christ, by worship, fellowship, education, and service. At Zion Lutheran Church we share the joy of Christ by living as children of God empowered by the Holy Spirit. Our church is open to serve all Christians and all God's children. Together we strive to grow in understanding and love for the greater Glory of God. We know that we can accomplish our mission by working together and getting to know each other through love, fellowship, and shared experiences. Walking into a new church can be intimidating at times, but we know that God blesses our congregation each time we welcome someone new at any of our worship services or gatherings. Do you have a question or a prayer request? Maybe you just need someone to talk to? Please feel free to send a message or come by our church office. We would love to hear from you and be of support. Check out our full list of events! We have many exciting things happening at Zion and you will not want to miss a single thing! Browse our website, newsletters, and like-us on facebook. We post updates all year long! We hope you can join us at our next event. We have a ministry or event for everyone at Zion. Give us a call @ 830-538-6335 and we can connect you with one of our dedicated Ministry Leaders. Want to know what we are doing? 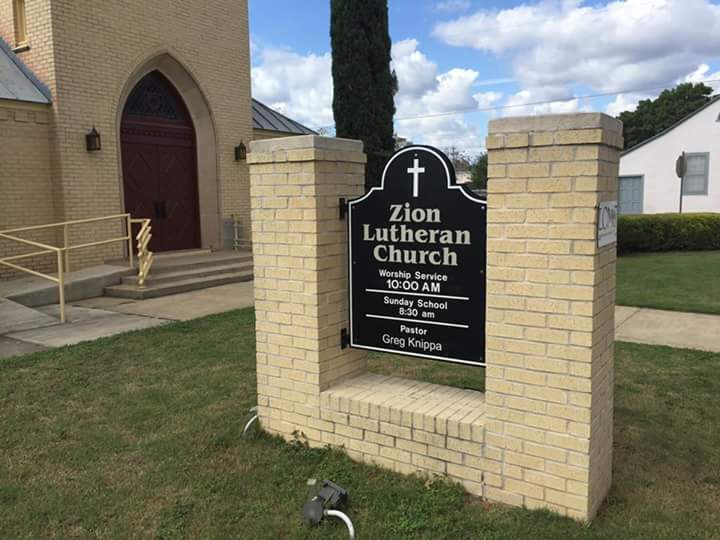 Are you wanting to get involved in Zion or volunteer for a Ministry? Awesome!! We would love to have you serve on a Ministry and part of our Mission team. We are always looking for loving-helping- hands.